During the first and second weeks of June, the College of Education’s Truman Pierce Institute (TPI) hosted two sets of students for summer camp activities on Auburn’s main campus. One of the camps welcomed students from nearby Loachapoka, Alabama, and was called the Loachapoka Exploring Auburn Days (L.E.A.D.). The other session was the 21st Century Community Learning Centers (21st CCLC) Camp. The L.E.A.D. 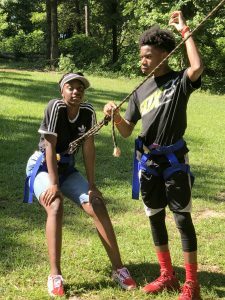 camp, which is sponsored by the Office of K-12 Outreach, offers Loachapoka High School students a week-long residential university experience. Both camps are directed by COE doctoral student Chris Wooten, who is an art teacher in Tuscaloosa. Both of the camps had common activities, including team building at the Auburn Challenge Course, movies and swimming, and shopping in downtown Auburn. But there was something new this year for the campers: trips to Montgomery. The EJI, which opened this year under the leadership of attorney and author Bryan Stevenson, gave the campers an opportunity to learn, in ways they never had before, about racial injustice, children in prison, mass incarceration, and the death penalty. For all of them it was eye-opening and sobering. For many of them, it was the best part of their week in Auburn. This was true for Daron Snell, of Union Springs. Another student, Chelsea Jones, said that prior to visiting the EJI, she was planning on going into the medical field. But now she is not so sure. Related to learning about social justice, the campers were also able to have hands-on service experiences. One of those was a day of working outdoors, starting at O Grows, the community garden managed by COE faculty member Sean Forbes. After some greenhouse work and loading plants for a farmer’s market sale, the students were off to a local school where they picked blueberries and peaches and prepared them for the farmer’s market. To date, O Grows has donated more than 8,000 pounds of produce to its community and provided a structure for students from the alternative school to learn management, sales, and organizational skills. To learn more about the camps and how you can become involved, contact Dr. Lynne Patrick at the Truman Pierce Institute. To get a feel for the fun and sometimes frenetic nature of the summer camps, enjoy this video from third-year camper Chelsea Jones.